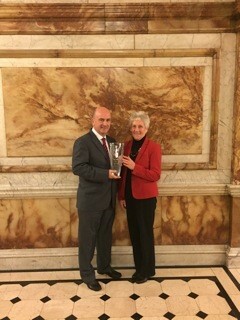 At a glittering sporting award ceremony in Glasgow, Karate was awarded the top accolade with Scottish and British Karate Federation President, Terry Connell, being presented with the award in recognition for Service to Sport. The evening had many prominent figures in Scottish sport including Louise Martin, recently appointed President of the Commonwealth Games Federation. The Scottish National Kumite Championships will be held on Sunday 22nd November at Meadowbank Stadium Edinburgh. On Saturday 3rd October 2015, The SKGB Referee Commission will be holding a Kumite Officials course at Holytown Community Centre at 1000 hours. This course is free to all members and will be for both new and qualified officials. On a day like this, we can finally share our joy and satisfaction for the work performed during so many years and the achievement of this objective. JKS Scotland Shotokan Karate Coach job application pack. Closing date 28th September 2015. Please click on PDF documents for full details. Job description click on PDF document. Job application click on PDF document. The SKGB are looking to appoint three Junior Kata Coaches one for each of the following styles. The SKGB are looking to appoint a Marketing Advisor. Closing date for applications end of business Thursday 24th September. The Scottish International Open Championships will be held on Saturday 23rd and Sunday 24th April 2016. Applications for the position must be e-mailed or posted to the SKGB office. Closing dates for applications 3rd of July 2015.